Editor’s note: In the latest in a new I-CAR column series on industry issues, marketing Senior Director Ann Gonzalez examines customer perception of auto body abilities and quality using surveys from the training organization and others. Each of us may believe we understand what really matters most for our collision repair customers. Yet, how are we really doing when it comes to meeting consumers’ needs from their point of view? In an independent study conducted by research agency Hall & Partners for I-CAR, consumers were asked what factors influenced their choice in selecting a collision repair shop. On average, they shared that the decision is made on price (71 percent), familiarity (57 percent), and service (51 percent). Safety was not mentioned. However, when the factors of safety and trained technicians were introduced for consumers to consider in ranking what’s most important, their priorities changed dramatically. The ability for their vehicle post-repair to protect occupants (83 percent) rose to the top of the list of what consumers would look for in selecting a facility, followed by a tie between restoring the original crash test rating and having repairs performed by trained technicians (both at 76 percent). The initial top criteria of price, familiarity and service all dropped in priority. Based on the results of the study, it’s clear that consumers absolutely do care about safety, but it’s also clear that, without education on the subject, they assume they will get equally safe repairs at all shops. So how can a business differentiate itself for the consumer and help educate the public that all repair shops are NOT created equal? In that same Hall & Partners research study, we set out to discover if a consumer could read a short description on what criteria to look for in a collision repair shop and have it influence their decision making. Consumers were shown a brief paragraph explaining I-CAR Gold Class, a designation for repair shops that have completed extensive training in proper collision repair annually with everyone involved in the repair process. After reading this paragraph, 78 percent of consumers said they felt Gold Class is extremely or very valuable; 48 percent wanted to know what qualified a shop to be Gold Class; and 31 percent, or 1 out of 3 consumers, immediately said they wanted to find a shop that has Gold Class. What’s particularly encouraging here is that in today’s messaging-saturated environment, it took only three sentences to explain to a consumer that “a shop is not a shop” and that they should look for certain criteria. So how can the industry use this information, and what does it mean to a collision repair shop? The No. 1 way that consumers find a collision repair shop is by talking to friends or relatives (66 percent according to the Hall & Partners study). So although individuals are only in a collision on average every 10 years according to the Allstate America’s Best Drivers Report, they have a lot of opportunity to influence where their friends and family take their vehicles for repair. An initial repair experience plus word of mouth—a verbal recommendation, negative or positive, by a family member or friend—sway many more customers than do other factors. In fact, a survey by Dimensional Research found that 95 percent of respondents who have had a bad experience with a company told someone about it, and 87 percent shared a good experience. All of this means that every customer who enters a facility has the potential of ultimately influencing the decision of numerous others through their circle of friends and family, as well as through vast social media channels. Therefore, how you relate to customers—what they see in your shop and their first repair experience with you—is important to your future success. It also means that you should take every opportunity to educate consumers while they are in your shop. From the estimating process through delivery of repaired vehicles, every step of the process is important. I-CAR provides a kit of marketing materials to every Gold Class shop that is intended to help educate customers during and after their shop selection process, reinforcing to customers they have made a good decision in choosing a trained shop. Visible in the shop are plaques on the wall, posters in the waiting room and brochures on the counter, all explaining that this business meets the industry’s standard for training. All the materials that are provided in the kit have tested well with consumers for understanding that Gold Class is a differentiator for a repair shop. Today’s Internet-savvy consumers are better informed than ever, but with modern vehicles featuring advanced technology and new materials, it’s critical to keep customers up-to-date on how the latest generation of vehicles are different and need different repairs. Consequently, it’s essential that repair professionals are trained on the processes and techniques that these new vehicles demand to both protect their customers and keep customers’ confidence through the knowledge that their vehicle’s repairs are done properly. If a facility expects to remain competitive in the future, it needs to be prepared for the demands of the changing vehicle repair landscape. Consumers are beginning to educate themselves more proactively about collision repair shops, with 20 percent saying they visit an independent collision repair shop’s website. You don’t need to have a large advertising budget to reach the consumer online. In fact, after friend and family referrals, five of the next 10 ways a consumer finds a repair shop are all on the Internet. Moreover, a study by the Word of Mouth Marketing Association revealed that one offline word-of-mouth impression drives sales at least five times more than one paid media impression. So how can you make your business visible online? What do consumers want to see? And where do they want to see it? Consumers put a lot of stock in online reviews, especially in social media. But referrals by trusted sources are not given lightly. They are based on satisfaction with the work you’ve done, and doing an excellent job requires familiarity with the best repair techniques for each vehicle. However, the marketplace is being deluged by a “Technical Tsunami” of new vehicles built from different types of materials, incorporating advanced electronics and demanding entirely new repair processes, making it challenging to stay abreast of all the knowledge that’s needed for a proper repair. In 2015 alone, automakers will introduce an estimated 142 new or redesigned vehicle models. These vehicles carry a wave of innovative structural materials, many of which require specialized training and possibly special equipment to repair. Even on conventional cars and trucks, recommended repair procedures can change significantly from one model year to the next. In delivering what customers are asking for, shops that have provided continuous training for their technicians hold a huge advantage over those that have not. Repairing a newer-model vehicle the same way you did even just five years ago could produce disastrous results. Training is one way your shop can not just survive, but thrive, in the future by letting consumers know you are prepared to fix today’s vehicles. Only 10 percent of the total industry has attained Gold Class with I-CAR’s Professional Development Program, signifying that the shop has met the industry’s standard for training, with another 7 percent on the “Road to Gold” (a business that is pursuing but has not yet achieved Gold Class). Businesses that invest in a commitment to training, and a culture of learning, should be advocates helping to inform customers that all collision repair shops are NOT the same. I-CAR has made it simple for consumers to find a trained shop by offering the Gold Class locator online at www.goldclass.com/locator. The locator tool is visited consistently month after month, generating ongoing visibility to Gold Class businesses. Additionally, an estimated 60 percent of visitors click on a specific collision repair shop listing to learn more – helping drive traffic to Gold Class collision repair shops. Customers place their highest priority on complete, safe and quality repairs based on their own experiences and on what others say about the level of knowledge in collision repair shops. And collision repair shops, like other businesses, owe their success to listening to customers and always looking for new ways to meet their needs. It’s important to view your facility through your customer’s eyes. Your customers and their families rely on you to keep them safe. Don’t make a life-altering mistake because of a lack of training. Do the right thing. Complete, safe, quality repairs provide families with peace of mind and can make businesses successful. 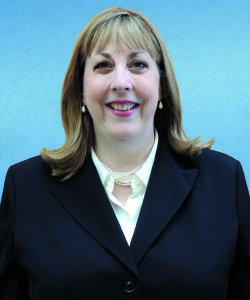 Ann Gonzalez is senior director of marketing for I-CAR. Her work includes using data and analysis to spearhead new marketing methods to better understand and serve the collision repair industry.